Baby Rhino Monty at Baby Rhino Rescue | Adopt and Donate Now! Monty was born at Rhino Pride on the 18th of November, 2014. 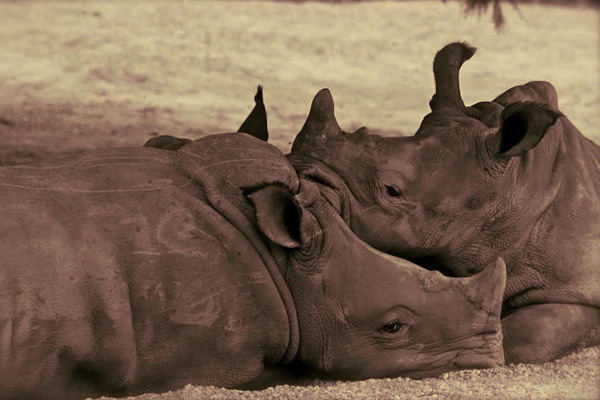 He spent his first 3 months in the big rhino camp with his mother and older sister. The staff noticed that Monty was wandering around with the bulls quite often and that the other cows with calves were allowing him to suckle. This meant Monty’s mother did not have enough milk. His condition deteriorated and he was moved to be with PJ, a blessing because PJ was alone and now they are best friends. Monty has been weaned, so he is an independent rhino now, but he will always love a belly rub.